Liberty City kids (left) protest for the right to play outside. 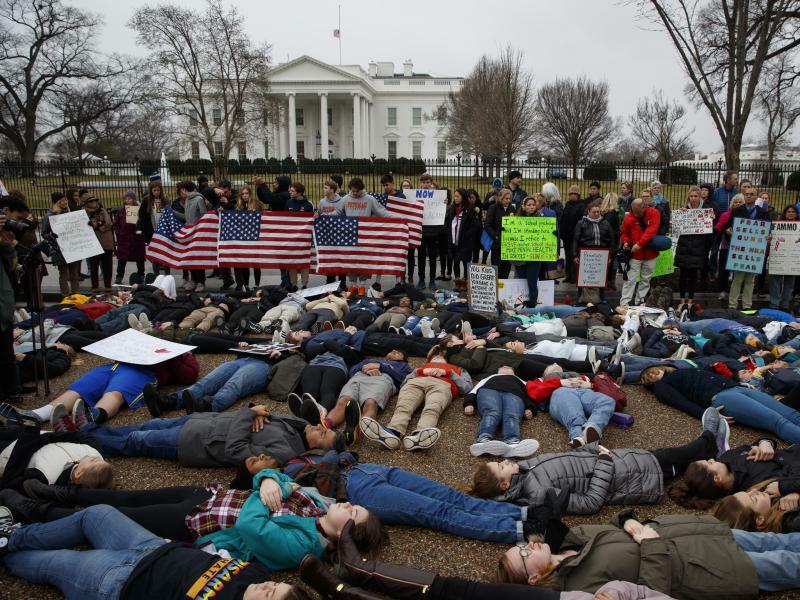 Students in Parkland (right) at an anti-gunviolence protest. 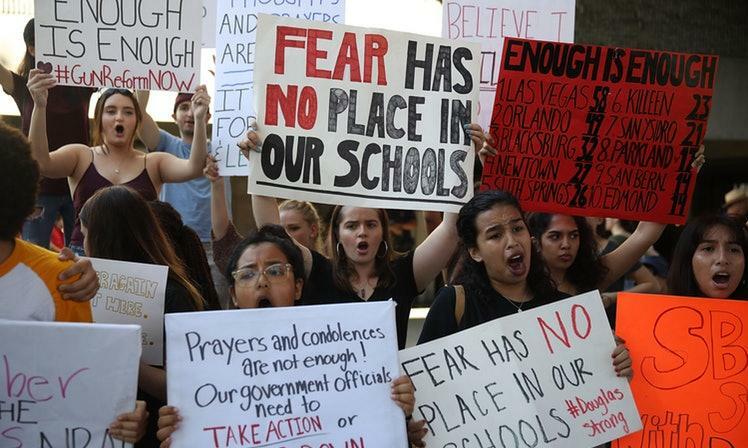 In South Florida, it's happened before -- young people rallying and raising their voices against gun violence. About a dozen elementary school kids took to the streets inside the Liberty Square housing projects in April 2016 chanting, " We don't want to die; stop shooting. We don't want to die; stop shooting." Their demand at the impromptu protest nearly two years ago was straightforward: They wanted to be able to play outside without fearing they might get shot. Kalaila Rollins, then a fourth-grader, said, "[What] I want to happen is that kids can come outside without even having to hear gunshots or be scared of where they’re living. " This past week, the teenagers at Marjory Stoneman Douglas High School led protests and vigils after one of the deadliest mass shooting in U.S. schools—17 killed. They want to be able to go to school without the fear of being gunned down. Young people took the adults and politicians to task for not doing anything to stop mass shootings. They chanted, "We are not responsible. We are not responsible. You are responsible. You are responsible." "Children bleeding out on school floors in previous years and months and days has not been enough for politicians to take action and say, 'This is not OK,' " said David Hogg, a student at Stoneman Douglas. "So that’s why we the students have to stand up and do this." Mass shootings and the community-level gun violence in places like Miami are not the same, but both groups of young people — the elementary kids in Miami and the teens in Parkland— are fed up. They want adults to hear them and do something about the bloodshed that has stained their innocence. The grief and mourning continue for the 17 dead students and staff killed in last week’s mass shooting at Marjory Stoneman Douglas High School in Parkland. But something else is happening among the anguish of the interrupted lives of the victims and survivors. Out of the agony — activism. They are angry. They are channeling their pain and stepping into the harsh spotlight of a heated and ongoing national debate. They are shielding their peers who feel too devastated to do the same. South Miami Mayor Philip Stoddard may be one of the most liberal mayors in Florida, so he would be a natural candidate to push through a package of local gun-control rules in the wake of the Parkland massacre 50 miles away. But that would be against the law. 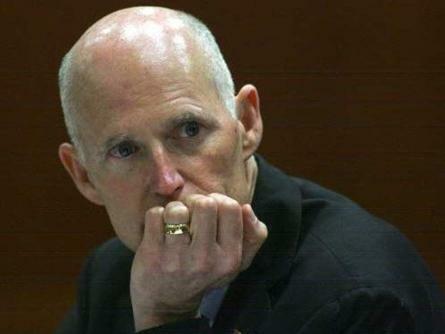 Florida bans cities and counties from imposing their own gun-control rules. Seven years ago, the Republican-controlled Legislature even created a $5,000 fine it can impose on mayors like Stoddard if they ever try to enforce stricter regulations on firearms. Gov. Rick Scott’s office on Monday said a series of meetings will be held Tuesday in Tallahassee to address school-safety and mental-health issues after a mass shooting last week that killed 17 people at a Broward County high school. A Broward county high school turned into a crime scene after a mass shooting left 17 people dead and more than a dozen wounded on Wednesday. Shots were fired on Marjory Stoneman Douglas high school students while they exited their classrooms during a fire alarm that began to ring moments before school was to be let out for the day.